Nathan Eyles and Brock Nichols. 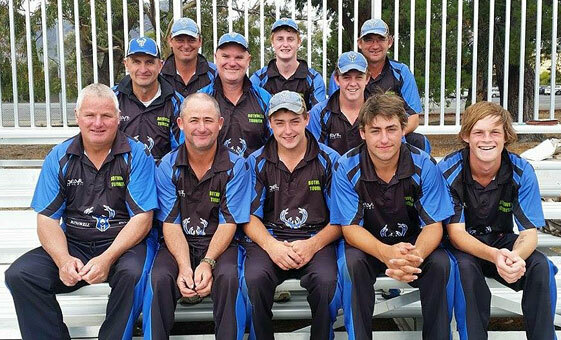 THE Bothwell Bucks went down to the Marquis Tigers by the big margin of 10 wickets in the Southern Cricket Association fourth grade final on Saturday. Playing on the Cadbury's No.1 ground, Bothwell I won the toss and elected to bat, making the small total of 10 for 111 off 43.5 overs. The Bucks lost wickets regularly, but opener Tyler White did his best batting nearly all the innings with a well-made 31. Matthew Eyles and Nathan Eyles were next best with 14 each. No other batsman reached double figures. In reply, the Tigers reached the target without losing a wicket, finishing 0/115 off just 18 overs. 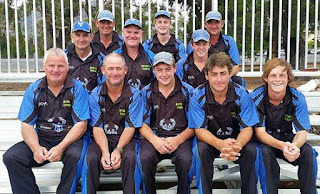 "It's been a gallant effort for the newly-formed club, who first started out with the one team, but soon grew to two," cricket writer Wade Gleeson said. "To be in your first season and make the grand final is a fantastic effort and congratulations must go to Joey Eyles and their hard working committee who did a lot of preparation work during the off season to be ready for the season start," he said. "Its not an easy pill to swallow, losing a grand final, but I'm sure the Bothwell players finished the game with their heads held high with what has been achieved in such a short time, both on and off the ground. Well done to all involved," Gleeson said.